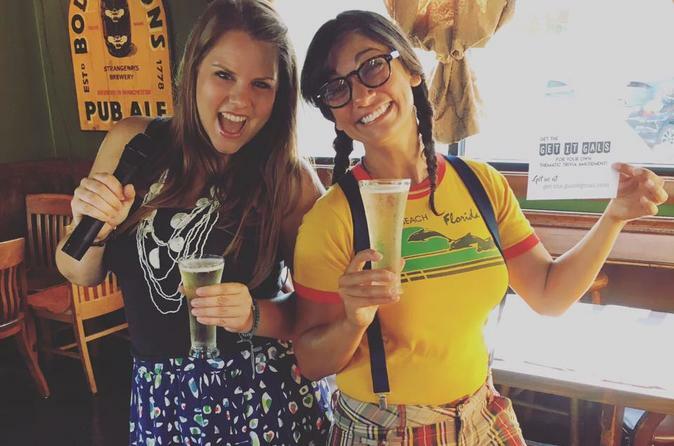 Join local trivia hosts, the Get it Gals as we venture across our favorite Austin hangouts, competing in team-based trivia along the way! Bonus drinks and fun prizes distributed throughout the evening to top-notch trivia players. We'll kick things off at 7pm at one of our favorite patio bars in town- Yellow Jacket Social Club. Upon arrival, the Gals will explain the rules of the game and divvy you into teams. Round 1 will consist of 5 cleverly-themed trivia questions loosely based around the bar's ambiance. Next, the group will head to Bar #2 for the next round, just a couple-hundred feet down the road to enjoy a true Texas treat, complete with live music, two-stepping, and a patio to (cowboy) boot! Then it's onto Bar #3, a quick walk and a beer snob's dream. We'll conclude our evening just down the road at every Austinite's favorite dance floor, where the DJ will be laying down 90's beats all night long. The team with the most points at the end of Round #4 will be taking home the Get it Gals Guide to Austin Swag Bag, chock-full of locally-sourced goodies for an ultimate Austin experience. **Bars subject to change.